Il n'y a rien comme des vacances passées dans Beautiful Messalonskee Lake, une partie de la célèbre chaîne de Belgrade Lakes. Notre chalet est situé à quelques pas du bord de l'eau, idéal pour la baignade, la navigation de plaisance, l'observation de couchers de soleil fabuleux ou simplement l'écoute des gorges. Pour le pêcheur, Messalonskee propose Trout, Bass et phénoménale Northern Pike, tous sont là pour vous attendre à lancer une ligne. This is our fourth summer at this little gem of a cottage. Without being ostentatious (because that wouldn't feel like Maine! ), it has all the simple comforts that allow you to sink back and breathe deeply of the peace and beauty. We're pretty relaxed people in general, but Shady Cove Cottage always proves that it's possible to soften up even more. Love the rocking chairs in the dining porch (in fact love ALL the chairs and sofas so thoughtfully placed in virtually every spot where a person would want to sit down to read, gaze at the lake, or catch some shade). Love the call of the loons in the mornings and evenings. Most of all, love that beautiful air, which comes off the lake like a kiss. Laurie Aho takes wonderful care of her guests, and your overall experience is one of feeling tremendously WELCOME. We're beyond delighted that we discovered this delicious little getaway. My wife and I had an absolutely wonderful time at Shady Cove Cottage. The place is very cozy and very well kept. 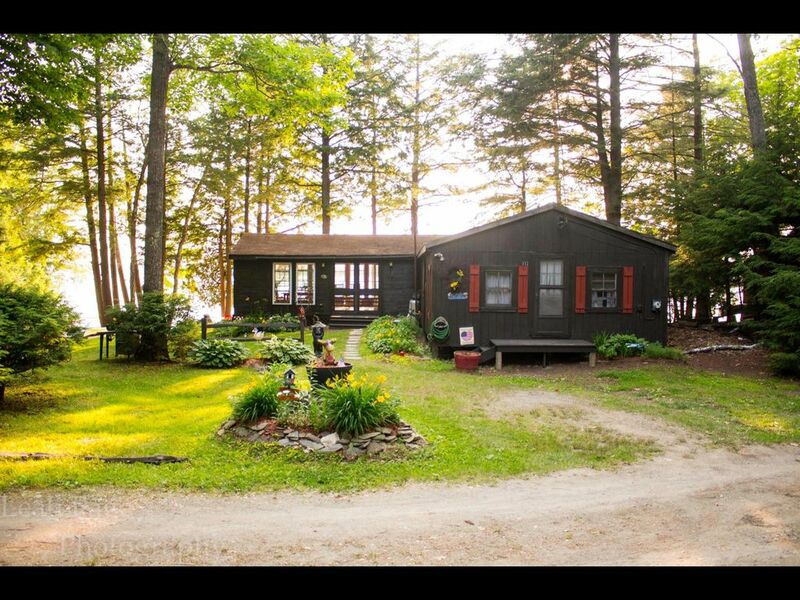 It is roomy and has a simply breathtaking view of Lake Messalonskee. Sunsets on the dock are memorable and relaxing. I absolutely recommend this place if you want a nice, quiet, relaxing place to unwind and enjoy a vacation! I have been coming to Shady Cove for a few years now and each time I come it seems to get better and better. I have made some amazing memories while staying here and certainly there will be many more made! To describe this destination in one word is hard to do but I would say the word would be paradise. From the beautiful scenery, to the lake and right down to the camp itself, this place feels so peaceful that you cannot help but slow down and forget all that's going on in your world. I would definitely suggest you look into booking a weekend or even a week here because you are not going to want to leave! Waking up to see the beautiful lake right outside the huge window in the main room made me smile every morning. My husband and I brought our 3 daughters, ages 9,6,5 and our dog for a whole week and not once did I hear "I'm bored"! We played in the water, jumped off the dock, went for walks, napped in the hammock, fished, ate our dinner on the screened in porch while watching breathtaking sunsets, I even read a novel while listening to the water *sigh* can I go back already? Everything was so clean and tidy and there was plenty of storage for us to bring our food for the week. Being 20 minuets from a superwalmart helped in case we forgot anything. My husband grilled just about every night on the propane grill and we loved having a fire pit after dinner for smores with the kids. We are counting down the days to be able to go again! The owners were so nice and very helpful, we would recommend this to our friends for sure. The property was inviting, clean and cozy! I was so impressed with this home away from home.Laurie made sure we had everything we needed to enjoy our vacation. If you enjoy creation this is the place to be. I've never been anywhere like it and I hope to return soon. The loons are calling me back to the lake and the sunsets and starry nights are inspiring! Eagles soar and fishing is great! And though you have the seclusion of Shady Cove Cottage there was plenty of places to go just 15 minutes away at the most. La côte du Maine, montagnes de l'Ouest et L. L. Bean sont tous à une heure de route. Augusta Waterville et sont à environ 20 minutes en voiture et offrent commerces, des restaurants, des cinémas et des terrains de golf. Weekly Rate: $800 - $1000 $800 per week for off season. $1000 for summer. Cleaning fee is mandatory charge. Kayaks and linens are optional- pets must be approved first. Check in: Saturday 2:00 PM Check out: 10:00 AM (No later Than!) We require a booking deposit of 50% to confirm reservation, with full payment received 30 days prior to arrival. Absolutely no large parties on premises, 3 car maximum on property at all times.